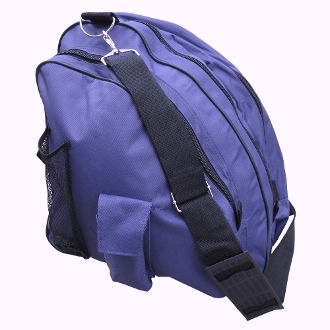 Deluxe skate bag includes two large compartments for ice skates or roller blades, an additional accessory compartment, pocket for a water bottle, pocket for a cell phone/mp3 player and an adjustable shoulder strap. Made from durable 600 denier fabric. Available in several colors. Click on image to see the colors. Kinzie's Closet favorite. This is the best skate bag for the money...very roomy and vivid colors.